Ciao'd in front of a crackling fire (the secret's in the oak). After a false spring warm snap that enticed daffodils, plum trees, and sneeze-inducing Acacia to bloom, we've been booted back to winter. This is the meteorologic equivalent to the cute, debonair guy you meet in a college bar who drinks bourbon instead of (or with) beer and makes you feel oh-so-pretty, witty and wise, and then goes home with the spray-tanned girl in the crop top. You know it's not going to end well. And it didn't. 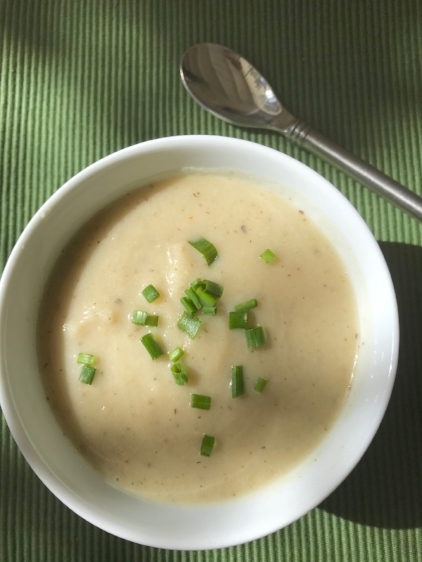 Roasted Cauliflower Soup with Italian Herbs is at once rich and healthy. (Thank you, soup angels, it's possible to enjoy both in one bowl.) Roasting cauliflower elicits its earthy flavor and locks in its gentle sweetness. A bit of char imparts a hint of smoke. The Italian herbs complete the flavor dance card. Feel free to use whatever you have on hand but I am partial to the rosemary-basil-oregano triumvirate. I tossed fresh rosemary sprigs and a few garlic cloves with the cauliflower for roasting and then included dried basil and oregano in the soup. Serve the soup with a green salad and crusty bread and you've got a simple, sensational meal just right for a rainy (or snowy) night. Rich in flavor yet low in fat, this soup is just the thing for a rainy or snowy night. In fact, it's just right for any night. Serve with a green salad and crusty bread and you're good to go. Substitute vegetable stock for the chicken stock if you prefer a vegetarian dish. Toss the cauliflower with the garlic, rosemary, red pepper flakes, and 2 tablespoons of the olive oil. Season with salt and pepper. Spread the cauliflower onto a rimmed baking sheet and roast until it is golden brown and tender, stirring occasionally, about 35 to 40 minutes. Heat the remaining oil in a saucepan over medium heat and cook the leek until soft, about 5 minutes. Stir in the basil and oregano and cook, stirring, until fragrant, about1 minute. Add the broth to the leek mixture and bring to a boil. Add the cauliflower, reduce the heat to a simmer, and cook 20 minutes. Puree the soup until smooth and creamy. You may need to do this in batches. Return the soup to the pot and stir in the Parmesan. Taste and adjust salt and pepper, if needed. Ladle into individual bowls and top with the chopped parsley or chives.